RGCCISD Fine Arts Department held a musical extravaganza in the heart of Rio Grande City where all of the musical talent in the district was showcased. The spectacular event was held on Britton Ave all the way to the steps of the Starr County Courthouse. The evening festivities began with the RGC Rattler Mighty Choir performance followed by the different district Mariachi groups. 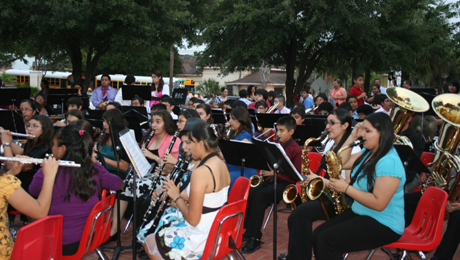 The Rattler Bands were also present and simulaneously played to the delight of the audience. The evening's program was deemed a great succees. RGCCISD photo.